Recently the folks at SentrySafe sent me their new Combination Big-Bolts Fire-Safe to review. I jumped at the chance, because we have been using a super small fire safe for over 10 years now, and it just isn’t cutting it anymore! The SentrySafe Combination Big-Bolts Fire-Safe is NEW, and offers 60% bigger bolts and a pry-resistant hinge bar for added security. I love that this safe is fire proof for up to 1 hour and 1700 degrees, plus it is water resistant for up to 24 hours in 8 inches of water. You can also bolt this safe to the floor if you are looking for even more security. I love how roomy this safe is! It is nice to be able to adjust the shelves to the height that I want, and I love the in door storage. Overall I am extremely pleased with this safe and would recommend it to anyone who is in the market for a combination fire/water safe! Learn more about the SentrySafe Combination Big-Bolts Fire-Safe including all of the specs here. SentrySafe is currently hosting a Spring Cleaning Challenge! Be sure to head over to their Facebook page to check it out, and you’ll not only have the chance to win FREE safes or a Target gift card, but you’ll also help a blogger win a donation to the charity of their choice! Get more details about the SentrySafe Spring Cleaning Challenge and vote for your favorites here. I also have 1 SentrySafe Big-Bolts Combination Fire-Safe to give away to one lucky winner! My favorite organizational tip: Don’t put it down, put it away. My organizational tip is to let my husband organize – and then I stick to it! Ha ha! Seriously, though, I’m great at organizing our files in alphebetical order and such…but the rest of the house is him. I organize my closet by hanging like items together and same colors together. A favorite organizational tip is to take pictures of things and donate or sell rather than store and clutter. Have a place for everything. My fav….each family member has a storage box for their “stock” of toiletries. Sorting through the mail as soon as it comes in and recycling the junk. Don’t keep all the papers the kids bring home from school. If it is a keepsake, scan it and toss the paper. My favorite organizational tip is to sort the pantry by shelves. One has bread items like bread, tortillas, etc. Another has cans but also sorted by expiration date since I try to buy in bulk, another has snacks like chips, cookies, crackers, fruit rollups. ANother has breakfast items like cereal, nestle choc mix, oatmeal, grits, etc. One has necessities like pasta, rice, boxed sides, etc. One has drinks such as canned drinks, tea, etc. And one of the shelves is MINE that my family knows not to touch! haha! I just suscribed and added you to my google reader! Use tiny bits of time to organize a drawer, your purse, one shelf. Try to clean up every night before you head to bed! Assign a place for everything you have, even for the smallest things. It becomes so easy to organize if we know where each thing needs to go. My favorite organizational tip is to always put whatever I get out, right back where it belongs. If I don’t it piles up and I have to spend lots of time re-organizing. Rss Subscriber to your blog! My favorite tip is to reuse what you already have to organize instead of buying more stuff. Baskets can be used for storing lots of little items, cereal boxes can turn into magazine holders, etc. I recently printed out a freezer inventory sheet, cleaned out my basement freezer, wrote down everything that I have inside, and stuck the sheet to the freezer door. It makes it so much easier to know exactly what (and how much) I have! My favorite tip in the kitchen is to put the things that expire first at the front of the cabinet. My tip is to put everything away right when you get home – otherwise it sits around for a few days, or even weeks! Go through your mail everyday so it doesn’t pile up! Get rid of the clutter so you don’t have too much to have to organize. Go through your mail as soon as you get it, put what you don’t want/need in the recycle box right away. I print out our weekly calendar from my icalendar on my Mac. Then I add our meals to that and display it for all to see. Everyone is then in the loop! I stay organized by filing things immediately and only keep the essentials. Favorite organizational tip is – everything has a place and there is a place for everything! Lists, lists, lists! I’m a list-maker. Regardless of what is being organized, I can’t do it without a list. My house has been a big mess of disorganization however, I am going room by room to put things in their proper places. The pantry is set up now by box items, bagged items, canned items all put together and the labels facing the front. 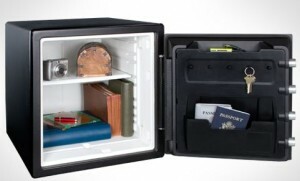 Also organizing important papers and could certainly use this safe to store and keep these items safe. I like to file things as them come, and yearly go through the file cabinet to shred docs that are no longer needed. I organize food in the pantry accroding to expiration date so I can make sure the oldest food item is used first. I subscribe to the e-mails! My best tip would be make a file for all your paperwork, bills etc. It can make a huge mess and will be easy to find when needed. I hot-glued spring-type clothespins to the insides of my kitchen-cabinet doors. They’re great for holding a printout of a recipe, the school-lunch menu, and other reminders without cluttering up the outside of the fridge. I subscribe to Stretching a Buck via RSS. I’m an email subscriber, I’d like to be entered into the drawing for the safe! :) Today I bought the Mamasource deal you told us about…the Little Kid’s National Geographic. Thank you! One of my favorite organization tips is to make your grocery list separated by store, then listing the items for which you have a coupon so you don’t forget them. Keep like items with like items. I broke my own rule recently and when I went looking for something I couldn’t find it. My tip is don’t just throw your mail in a pile on the table or wherever becaus before you know it you will have a mountain. I lay everything out for my kids and myself the night before even better if weather is consistant will lay out clothes for the whole week! I receive your e-mails, THANKS!! My organizing tip is to keep up with things and put them away instead of leaving it for later. And I keep a lot of lists! My organizing tip is to have a bill basket. When the mail comes, put the bills in the basket and twice a month sit down with the basket and your checkbook. No bills ever get lost or not paid. organization tip: file whole coupon inserts by date so you’ll have to access to every coupon when you need it without having to clip them all. My organizational tip is to put things in their place as soon as you get them or finish using them. I found that the only thing that works for me is to scan or copy/paste so I have electronic copies of stuff (they’re so much easier to file in electronic folders than papers!) and then I put all the important papers on a pile…figure I can dig if I ever need something from there lol! My favorite organizational tip is to plan ahead whenever possible. Take meal planning for example – when dinners for the week are planned in advance I feel much more organized getting home at night and facing the dinner, bath, bed time rush.